Do you want a sheepherder’s job? Look for yourself and you can make a whopping $650 – $750 a month! No, that’s right now, not some time in the future like 1950! It’s a career full of challenge! You get to work with dogs, sheep, and sometimes goats! You also get to work for people who have great connections with the Legislature in any given western state! Hell, you might even get to work FOR a legislator!………. A lot! Doesn’t it sound exciting?!!! Not only to do you get to experience extremely remote areas for long amounts of time you may be exposed to interesting diseases like Q-fever or others! To find out more read this! US citizens need not apply. Give it up on the Q-fever. What a laughable charge against livestock. Where is it common; in farm yards with dense numbers of livestock. Even there people hardly ever get it but wow what a great thing to put in public comment on grazing. From what I know it has had absolutely no impact on public land grazing since the odds of it effecting some one are less that being attacked by sage grouse. I find it interesting that Red Rock Lakes National Wildlife Refuge felt compelled to warn people about it on their map. Also, there have been a few outbreaks with it at the sheep station. Q-fever infects hundreds of folk ~ goes airborne. one of the problems many scientists warn about with Q-fever is its slow incubation. that is to say, symptoms don’t show up until much later – so it’s difficult to identify the source, and most of the folk handling sheep do so in the back country and not a lot of attention is paid to their health (given their immigrant status) – they just come down with flu-like symptoms and by the time it’s identified in anybody that has access to medical treatment facilities, they’ve forgotten about their exposure to sheep, or aren’t aware that this is where it might have come from. There are warnings for all sorts of things doesn’t mean it is a high probability. Every scoping letter I read that brings up Q fever means another search of the literature and nothing new about infection rates. They could get the same remote job sitting on pot plantations and make only a little more. It comes down to what people are willing to do for money if they are willing it will never change. Yeah, that good old “free market”. Gotta love it. The other obvious problem with this system is that there is no way in hell that these guys are going to be able to meet all of the terms and conditions on the grazing allotments when they are working 24/7 with no real support. They can’t possibly guard against predators or keep track of all of the sheep either. One prominent sheepherder claimed at a public meeting a couple of years ago that he was missing 200 sheep and blamed it on wolves even though he never reported it to Wildlife Services. Are we to believe that none of them were just lost and left out on the range? 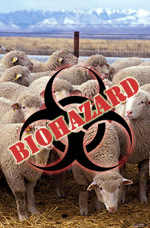 Left to contaminate bighorn sheep herds? Most of these sheep herders are legal documented aliens who cant make that kind of money back home. They are happy to get the work and when you consider that it also comes with “room and board” albeit spartan, it is not that bad a deal for them compared to their economic situation back home. The last time this topic came up the posting included a story of a herder who managed to put his 2 US born kids thru college with his herding money. Domestic sheep may not be the best thing for the range but the sheep herder “outrage” is a red herring. Can’t disagree with your logic, but I do take exception with the idea that “outrage” over these wages is a “red herring”. At the very least, sheep producers (and every business, for that matter) should be forced to pay a wage that allows people to live above the poverty level. We should all be outraged by this blatant exploitation of the underprivileged. Nothing associated with old world sheep, production of anything from old world sheep, sheepherding, wool, mutton, or any other product or activity associated with old world sheep is anything but tainted. The animals carry physical diseases and, by virtue of their behavior and willingness to engage in the spread of such physical disease, the humans carry spiritual diseases. Don’t believe me? Meet a few of them and get to know them and their industry. The impact on the range (makes cattle look like golf course groundskeepers), the impact on native sheep, the treatment of the workers, the scabies, the pneumonia, the scrapie and the prions that are now everywhere; it’s all just a shade sick, even by comparison with cattle operations. Still don’t believe me? Have yourself a nice big plate of scrambled lamb brains and, in a few years, it won’t matter what you believe; you’ll just be staring out the window and trying to remember your name. It won’t be anything to do with sheep; it’ll just be natural Alzheimer’s (that’s what they’ll tell your caregiver as you’re wheeled away). I see sheep herders all the time up in the mountains and every time I try to tell them about missing sheep I found I would probably have better luck talking to a tree. The owners are not much better, stuck in there ways. Try to talk to them about changing routing patterns to avoid wolf rendezvous sites and they say its just a part of business but when the sheep get killed they want compensation. What BS. the work sheepherders do in America is worth more than $600 – $750 per month in the United States of America. that’s the bottom line. As a matter of basic human dignity, the national origin of a worker/sheepherder ought not depreciate the value of the work at hand. To suggest otherwise is discriminatory. The work is worth more – the worker ought not be valued less. $600 – $750 per month is slave wages here in America, and it is here in America where these slave wages are currently deemed acceptable. that says a hell of a lot more about we as Americans than it does about Peru’s labor laws, the actual value of Peruvian indentured servants who are being exploited, or the twisted rationale which would suggest that this slave-wage race to the bottom is acceptable because it’s relatively “good” treatment compared to the countries where the folk are coming from. any labor law – or way of looking at just compensation – that establishes the value of work based on the national origin, skin color, race or even language spoken of the worker involved rather than setting the rate of compensation at the work accomplished ought be fervently criticized and condemned. America ought not set its bar for the way it treats fellow human-beings – and the dignity of work accomplished – at “better than” the countries where a certain group of folk are coming from. it should be set by what the work is worth. we ought set a high bar in our valuation of basic human dignity. if the work being done ain’t worth minimum wage (and i’d argue a living wage), then it ain’t worth doing. if woolgrowers can’t compete paying minimum wage, then grazing sheep ain’t valued enough in our society (let alone economy) to be worth doing at all. Again, America is not a third world country – our respect for basic human dignity ought be assessed at the highest of standards in the world. it just ain’t worth the trade-off otherwise. just another example of how grazing sheep can’t compete in the real world, playing by the same rules of environmental stewardship, basic human dignity, etc. as everyone else.